Around the house or an office, everything should be very neat, clean and well organized. Clients have realized how important decoration items are, and the value they add to their homes and offices. Once you have decided to run an office, there are things to consider. No matter how clean one would want to be, there will always be something to dispose of. This is why there is always a place to dispose the litters; however, being in an office, a classy dustbin is required. 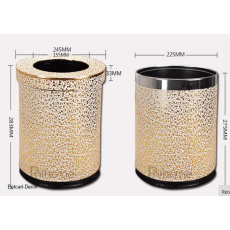 A leather office dustbin can do since it is not only durable but also very classy and beautiful. This is an item that will help one keep the office clean, and at the same time make the place look very presentable. Our products are purchased at very affordable rates, and where shipping and installing services are required, we do assist. Buy our interior décor items and you will never regret.